We have decided it would be fun to post Mountain Colors stories, news, etc to all of you who read blogs, online newsletters, etc. This is our Premier posting!! 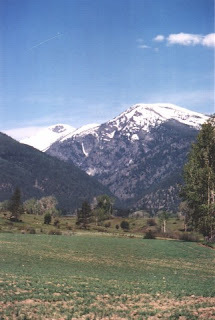 The picture to the right is of the Bitterroot Mountain just to the west of where we live. Now you can visualize the scenery when you think of our yarns!! We love to use the local views as inspiration for our colorways and as many of you know we also use the natural habitat of the area for our names. It is always great fun when we have to brain storm about new color names. Husbands, children, dyers, the UPS...everyone has ideas! As we become more comfortable with the workings of this blogging software we will be posting pictures, contest announcements, what new things are in the works, etc. I know we won't be writing as frequently as some folks do but check back every few weeks and I know we will have more news for you. We welcome any helpful hints. What would like to see? What information would you like to read about? Let us know what you think! !